All lead acid batteries have positive plates coated with lead dioxide and negative plates of soft spongy lead. In the past lead plates were conditioned through up to 50 charge and discharge cycles to build up these dioxide and spongy lead layers. In order to reduce cost, these days the active material are chemically prepared and pasted on hollow wafer like lead grids. When a current is passed through the positive grid is converted to lead dioxide and the negative plated is converted to spongy lead.The plates are also separated by wooden or plastic separators that allow the acid electrolyte to flow through the plates and the gas to escape. The most common problem is sulfation due to leaving a battery in an undercharge condition. While this does not ‘kill’ the battery immediately it decreases the charge capacity of the battery. If the sulfate is allowed to get to third stage crystalline sulfate the process is no longer reversible through normal charging. Another result of low discharge of an auto start battery is the reversal in polarity of one cell. In this situation the voltage will measure 8.5 volts. This battery is dead and is not restorable. Shocks and dropping of the battery will result in active material being shedded from the plates. This leads to reduce capacity and the loose deposits can lead to a short if lodge across the plates, or if a connection across the plates is effected at the bottom of the battery. These batteries are not considered for restoration. Air pockets are formed between the plates and if not dislodge that part of the plates is effectively rendered useless. Nothing can be done about this except to say that good grid design and quality separators will prevent this from happening. This is why cheap batteries don’t last, in addition to shedding of active material above. If the electrolyte level falls too low the lead plates will oxidise with the air. This is lead oxide and not lead dioxide. The battery loses capacity. Always keep the battery top up with distilled water. Do not add acid or tap water. The fluoride and other chemicals reacts with the spongy lead and renders it useless. If you own a battery bank or a traction battery, regular desulfation will ensure that the battery maintain peak capacity. For those who own expensive marine deep cycle batteries restoration instead of replacement may be more cost effective. In most cases we are able to tell you how much capacity our restored battery holds. Can sulfation be prevented ? Yes, we have a maintenance version of the electronic desulfator. This has lower power pulses and works only when the alternator of the car is operating. Attach across a car battery it will effectively prevent sulfation. Why do some new batteries fail? All retailers of batteries are advised to rotate their stocks on a first in first out basis and if the battery has been on the shelf for 3 months or more it should be returned. Even new batteries sulfate sitting on the shelf. The paste making up the active material is mixed in sulfuric acid. This acid reacts with the lead dioxide to form lead sulfate. 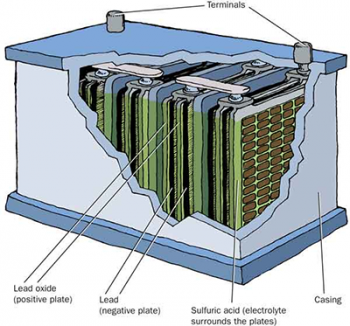 Therefore a new battery is sulfated and has to be ‘conditioned’ (Charged and discharge repeatedly) to completely convert the lead sulfate to active material. This is not usually done because of cost. Therefore if the battery sits too long on the shelf the lead sulphate will crystallized and become inactive. By contrast a restored battery is completely desulfated and so has a very long shelf life. All batteries will self discharge over time. Good quality batteries are better at holding their charge than cheap batteries. A good quality desulfated battery cost about 1/3 or less than the price of a cheap battery. When comparing prices most people compare a restored battery to the cheapest new battery on the market, when in fact they should be comparing it with one of the same make because it is exactly what they are getting. How long can a restored battery last ? If the battery is looked after and used correctly it should last a long time. Batteries that we have desulfated over 2 years ago are still in use. In motor vehicles only a small portion of the charge is used to start the car and it is then recharged by the alternator. If they are kept fully charged and regularly used they will last many years. Deep cycle batteries are more prone to damage from over discharge. Deep discharge will stress the active material causing it to fall off the plates. Lead sulfate occupies more space than lead dioxide, so too much of lead sulfate formation will cause the plates to buckle and the battery to bulge. If the battery is not subject to discharge greater than 50% then it can last a long time. Is gel better than flooded cells ? For the same capacity gel is more expensive. It has the advantage of higher operating voltage and efficiency. You also do not need to ‘top up’ the battery and is more resistant to damage from shocks. The problem is that you can damage gel batteries if you use a high current charger. They must be charged over a long period using a low power charger. I am working on a set currently I will flick you a pic and some details. Looking for a price on reconditioning a battery from a 2002 Mitsubishi aspire, small positive and negative terminals. Have sen you an email. Repair would take about 4 days, it depends how fast the battery responds to the desulphation. It also depends on how big they are the bigger the battery the longer it will take. Hi I’m wanting to buy a good used battery for an Toyota altezza RS 4 cylinder with small positive negative terminals thanks. Hi sent you an email. Can repair yours $40 each. We have some 8 volts now, but no more 6 volts. However they do come in periodically. Yes we have done so before. Drop it in and we can take a look. Hi, I have 2 Trojan 6v deep cycle batteries on my boat. There are just starting to show some bulge of the case and are about 6 years old. What are the chances they will respond to de-sulfication and what is the cost ? $60 – $80 each depending on the size but there is no charge if it does not work. So there is no downside to trying. Hi there, I’m looking for one or two 12 volt deep cycle batteries. What do you have available? Cheers. Hi, I have a Deep cycle Trojan 27TMH that has all cells completely dry. Can you reco? if so how much? We can take a look. Often plate exposure to air makes the battery unrecoverable due to oxidation. I’m in need of a deep cycle battery (preferably AGM ) for a solar set up. Do you have any batteries above 200ah? Hi do you have any DIN 85 reconditioned batteries?